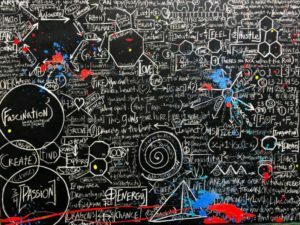 (Palm Beach, FL)– Those familiar with artist Brendan Murphy’s fascination with Space will have the opportunity to meet him and view his latest creations on January 31st at Contessa Gallery. 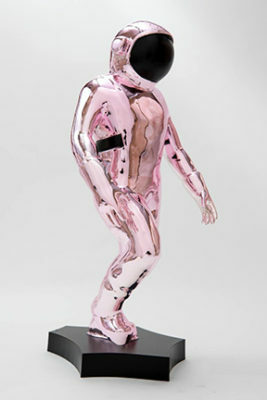 The much anticipated 7-foot Boonji spaceman sculpture which was unveiled at Art Basel will also be on view at Contessa. The well-received life-size sculpture continues to attract quite a bit of social media attention#MeetMeAtTheSpaceman. Other highlights of the exhibit include Brendan’s chalkboard portrait series and the DNA fingerprints. Well known to collectors from Art Basel to Silicon Valley, artist Brendan Murphy trained under Eric Fischl, Ross Bleckner and David Salle. Murphy pushes the walls of creativity beyond the confines of the canvas. He explores sculpture work, concept pieces, and a wide range of different materials and tools. In doing so, Brendan has developed his own style, a definitively dynamic mix of the abstract and figurative form. Brendan currently works from his studios in Malibu, California and Brooklyn, New York. His work is represented in over 500 private collections and has been featured in museums and galleries around the world. Steven Hartman, Owner of believes Brendan’s latest works are a good fit for the newly opened Contessa Gallery on Worth Avenue. “You’d be surprised how many people have walked into the gallery and asked specifically to see Brendan’s futuristic work,” remarks Hartman. Each of Murphy’s works maintain a consistent exploration of color, language and symbols. Thematically, the artist explores the interplay of beauty, power and the need to understand the energies of life. Murphy is particularly inspired by art’s potential to transmit positive energy, and the effect that the positive energy has on society. Brendan Murphy’s talent lies in his ability in balancing these various elements of exploration against the backdrop of his greatest inspirations; beautiful women, athletes, powerful symbols and the spectrum of human emotion. Contessa Gallery has many of Brendan’s unique pieces on exhibit at their new Palm Beach location at 247 Worth Avenue. Gallery hours are Monday through Saturday from 10 a.m. to 6 p.m. and Sunday by appointment. Brendan will be making a special appearance on January 31st during regular opening hours. Founded in 1999, Contessa Gallery is a Fine Art Dealers Association member (FADA) that offers artworks of exceedingly high quality as well as art acquisition counsel to collectors, museums and institutions. Areas of expertise include pre-20th century, Modern and Contemporary sculpture, paintings, photography and works on paper. While many galleries focus primarily on artist representation and promotion, Contessa Gallery is collector focused. The gallery’s mission is to assist clients in developing collections that have deep personal meaning. Contessa Gallery encourages its clients to view their collections as a legacy that can be passed down through generations or to art institutions. Based out of Cleveland, Ohio with a new gallery in Palm Beach, Contessa Gallery has participated in prestigious art fairs, such as Art Miami, and in shows in the Palm Beach area for the past 10 years. At the philanthropic level, Contessa Gallery aims to make a difference in the community through the contribution of time, expertise, sponsorship and educational programming for museums and organizations dedicated to the arts.